Earlier this year, I asked Brenda Drake if she was interested in some technical help for her next pitching contest. Specifically, I told her that PitchWars and PitchMadness might go a lot more smoothly if the submissions were done by form rather than by e-mail. Because you can control a form. You can prevent submitters from claiming multiple age categories or making up genres. It seemed a good idea at the time, and it would make things much easier when it came to crunching the numbers on submissions. Fast forward a few months. I was still keen on the idea of a form submission. Brenda and I had looked at some mockups. It seemed like it might work, and almost certainly would avoid the Gmail-induced nightmare that plagued last year’s Pitch Wars. I’d also managed to land a literary agent of my own. Brenda asked if I’d like to be a mentor, too. I said “Yes!” without even knowing what it entailed, because that’s what you do when Brenda asks you something. The submission system required a bit more intricacy than I’d realized. The form was rather tedious to assemble (I had to enter every mentor’s name four times) but otherwise was straightforward enough. When submitted, it routed the application to two e-mail addresses, where a series of message-filtering rules would auto-forward to the appropriate mentors based on a message-body search for mentor names. We ran some tests, and it looked like it was working. Brenda decided to pull the trigger and open the submissions window early. Then the submissions began pouring in. Over 120 came in the first night alone. The submission rerouting system worked fairly well, though Gmail’s powerful search capabilities created an interesting side effect: it searched the query letters and attachments, too. As a result, any submission with a character named Maggie who walked down a hall went to Maggie Hall. Any submissions that mentioned karma and had something brown went to Karma Brown. Whoops! Luckily, the submissions went to the right mentors as well. Maggie and Karma were good sports about it. 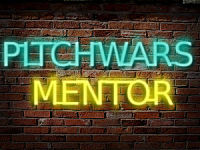 According to the 2013 PitchWars statistics compiled by my co-mentor Sarah Nicholas, the contest saw 679 unique entries last year. 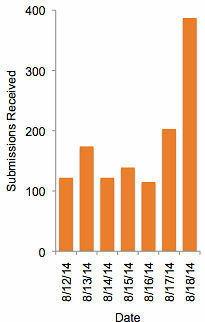 A day or two before the window closed, I told Brenda (privately) that we’d almost certainly reach 1,000 submissions. When all was said and done, my official tally for #PitchWars 2014 was 1,238 entrants! That’s an increase of 82% over last year. Competition is Fierce. And Skewed. The unfortunate news is that, although we have more mentors this year, the competition is still extremely high. Your chances of being getting in (as a mentee or alternate) are 11.8%, assuming all mentors pick different alternates. We’re not required to do that, but we’re trying to. Your chances of becoming a mentee (the top pick) are just 5.9%. That’s pretty tough. Many agents have partial request rates higher than that. Similar to last year (and most of Brenda’s contests), the young adult category dominates all others. However, the proportion of YA went down slightly (from 51% last year) while adult (25% last year) and middle grade (14% last year) gained. New Adult stayed about the same, representing less than 10% of submissions. Tip your hat to Brenda Drake, because she brought in mentors for age categories at a distribution that almost exactly mirrored this (45% YA, 23% Adult, 18% MG, 14% NA). If you recall, each applicant picked up to four mentors to consider their submission, and most did so. 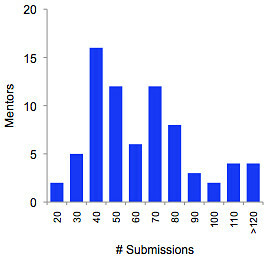 Thus, each mentor had, on average, about 67 submissions to consider. Try to do what was best for the submitting-writer. Personally, I got a healthy number of submissions (74) and had a few that I really, really liked. One of these I offered to another mentor, because I knew she’d be a better fit. Lots of deal-making went on. Choices were agonized over. Remember, this is a competition for the mentors, too. Eventually we all had to show our cards, and reveal our favorites. 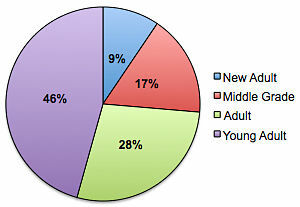 Fantasy was the most prevalent genre for every age category except new adult. 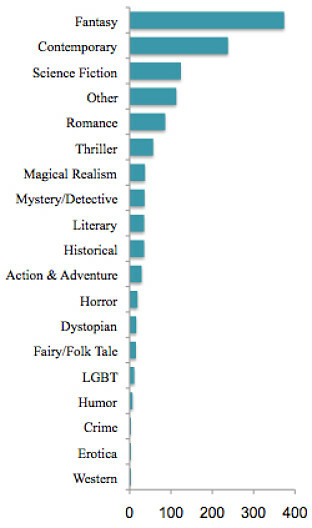 Granted, fantasy is a rather broad genre, but it’s also a popular one. “Other” seemed to be a pretty popular choice as well; I guess many of you weren’t satisfied with my list of genres (which, by the way, I got from reputable sources in the publishing industry). The good news is that mentors (and soon agents) have a lot to choose from. The harder-to-swallow news is that if you submitted YA Fantasy or Contemporary, you have a lot of competition. Enough about harsh reality. Let’s talk about the brighter side of things. The community of writers brought together by #PitchWars is simply astonishing. Submissions wowed us. Twitter interactions and Google Chats and other submitter-led activities impressed us even more. I’ve enjoyed getting to know all of you as much as I’ve enjoyed interacting with the other mentors. Your awesome writing made this process hard, but your energy and enthusiasm made it fun. It saddens me a little bit that 1,092 of you fine folks will get some not-so-great news tomorrow, when the picks and alternates are announced. I’d like to echo the request of my co-mentor Julie Sondra Decker: don’t unfollow the mentors if your submission wasn’t chosen. I’ve been part of contests, and I know it’s hard to stay around while a few lucky people are jumping up and down with glee. But we do this contest for ALL writers, not just the ones who are chosen. Even if you aren’t picked, there are other ways to win. You won if you wrote a book. Virtually everyone wants to write a book, and 95% of them never do. You won if you submitted your work, because it’s not easy to do. You won if you made new friends or found a critique partner. You won if the tweets or blog posts or even rejection letters offered you good advice for your own writing. You won if you decided to keep writing. Because that’s what it takes. Good luck tomorrow, everyone! And, on behalf of the mentors, THANK YOU! This rocks! Thank you for doing all this hard work on top of your daily grind and mentoring. I hope whomever you chose is excited to work with you. Thanks for all this information, Dan! It’s very interesting to see. I’ve really enjoyed Pitch Wars and everyone involved. It really is an amazing community. No matter what happens, I know I’ve already grown as a writer. Thanks again! This is a great post with lots of awesome info. As much as I hate math, I love this kind of break down. Great post, Dan. Always interesting to hear the stats. 🙂 This was my first time entering PitchWars, and I thought the submission process was awesome! (Yay you!) Thanks for all your time and work. Thank you, Dan for this and all that you did in making #PitchWars run smoothly. This data is very interesting. I would guess that the number of pitches to each mentor were directly proportional to activity on the #PitchWars feed, at least within genre. Thanks again for all of your hard work, sharp wit, and kind words. Dan, thanks so much for putting in the work to compile these! Really interesting. Best of luck with your mentee(s), whoever that turns out to be! Wonderful stats, advice and commentary. I find it hard to believe that anyone would unfollow people who are giving up time, energy and wisdom to help other writers…as volunteers. I hope no one does. Even though I’m terrible at compiling stats, I always love reading them. Thank you for doing this and for making the super easy to use submission form!